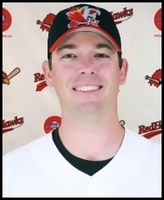 Michael Schlact was named as the RedHawks manager on September 7, 2017 and is only the second manager in franchise history. Prior to that, he had been the pitching coach for the club since November 2014. Schlact has served as the RedHawks’ Interim Manager since August 13, 2017 and in that time, the RedHawks finished 16-8 and finished one win short of the American Association Playoff Wild Card. Included in that record were series sweeps of the Sioux City Explorers and the St. Paul Saints, and the team only lost consecutive games once down the stretch. He made the transition from player to coach in 2015 and brought ten seasons of professional experience to the job. In addition to his managerial duties, Schlact will continue to oversee the RedHawks pitchers. Schlact began his professional playing career in 2004 after being selected by the Texas Rangers in the third round of that year’s draft out of Wheeler High School in Marietta, GA. Schlact spent seven seasons in the Rangers organization, reaching as high as the Double-A level with the Frisco RoughRiders of the Texas League in 2007-2010. An arm injury caused him to miss most of the 2009 season. He signed with the Southern Maryland Blue Crabs of the of the Atlantic League in 2011 and returned in 2012, only to see his season cut short by another arm injury. He pitched briefly with the Amarillo Sox of the American Association in 2014 before ending his playing career.